At CNS News today, Terry Jeffrey writes, "The United States has the highest top statutory corporate tax rate—39.1%--of any nation in the G20, according to a study released Wednesday by the Congressional Budget Office," and then adds, "That rate is nearly twice as high as the 20-percent rate in Russia, which, along with Saudi Arabia and Turkey, has the lowest statutory corporate tax rate in the G20." "The U.S. won the top spot on the statutory-corporate-tax-rate list after Japan and Germany, which formerly ranked first and second, cut their rates. 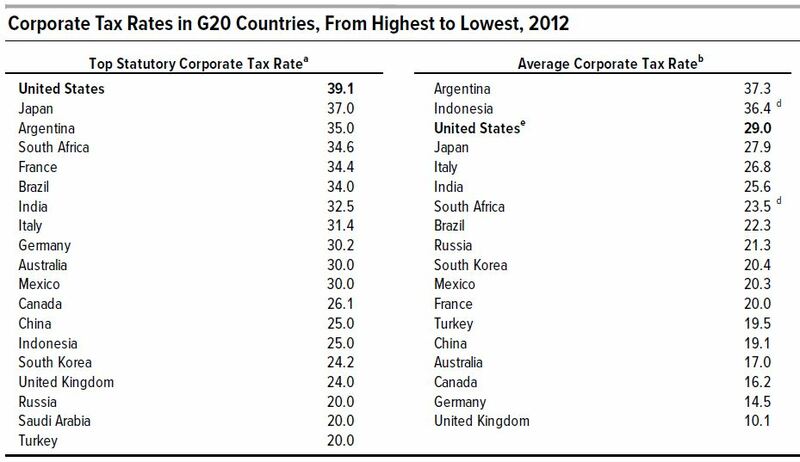 "The CBO report looked at three different measures of corporate taxation in the G20 countries. These included the top statutory corporate tax rate, the average corporate tax rate, and the effective corporate tax rate. "The top statutory corporate tax rate in the United States includes the top federal tax rate on corporations combined with the taxes that states impose on corporations." "All three types of corporate tax rates affect a company’s decisions, but each influences a different choice. Because of their broader scope, average and effective corporate tax rates are better indicators of a company’s incentives to invest in a particular country than is the statutory corporate tax rate. The average corporate tax rate reflects a country’s corporate tax rate schedule, the system’s tax preferences for business investments, any surtaxes, and possibilities for tax avoidance or evasion. Companies consider the average corporate tax rate when deciding whether to undertake a large or long-term investment in a particular country. The effective corporate tax rate, which is a measure of the tax on a marginal investment, is more informative for decisions about whether to expand ongoing projects in those countries in which a company already operates. In contrast, businesses focus on the narrower statutory corporate tax rate when they develop legal and accounting strategies to shift income earned in high-tax countries to low-tax jurisdictions—especially low-tax jurisdictions in which those businesses do not plan to invest and from which they thus expect no benefits from tax preferences for business investments." Jeffrey includes the following chart with his report, but notes,"The full version of this chart, including the rankings for the "effective corporate tax rate," is on page 2 of the CBO report:"
Ask for a written response. And tell them ACTA sent you.